We have all done it at one time in our young lives, wanted to dress like mommy..and this little lady is the perfect example of that! 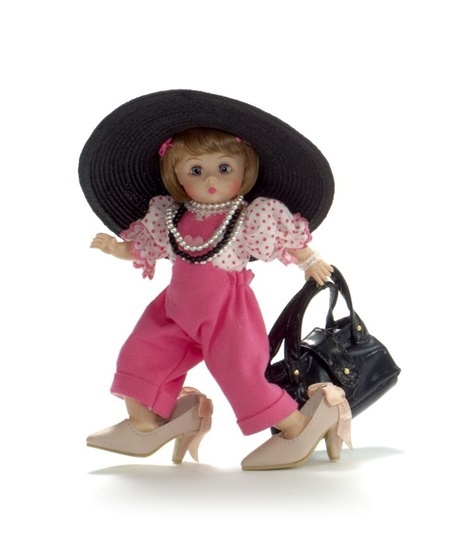 "Dressed Like Mommy" is an 8-inch fully-articulated Wendy with blue eyes and a short Tosca bob. She is wearing pink bib overalls that features a heart applique on the bib. A pink polka dot blouse, with short sleeves trimmed with pink scalloped lace, is worn with the overalls. White anklets and pale pink heels add to this charming ensemble. A long strand of pearls wrapped twice around her neck, a matching iridescent necklace and bracelet and a black bead necklace add lots of "Mommy glamour" to her outfit. An oversized black straw hat that is trimmed with a tulle bow and pink roses along with an oversized black vinyl purse completes this adorable look.